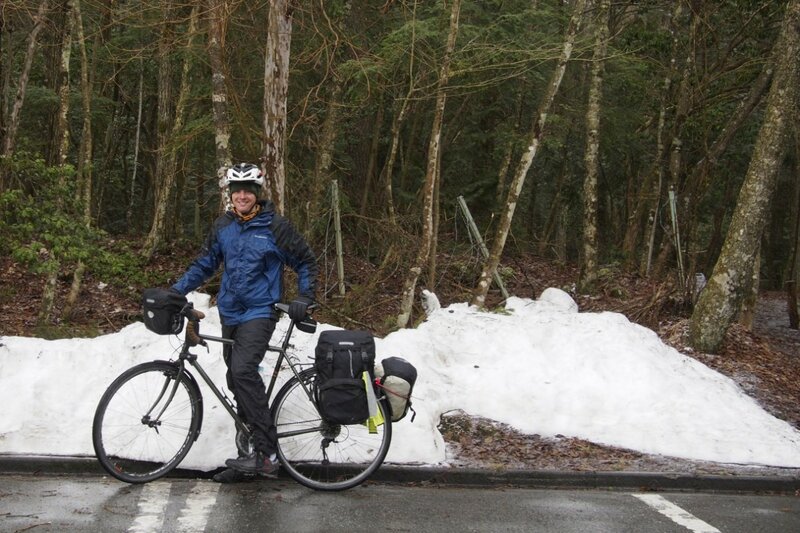 The last few days we had been riding through towns whose names had a clear hint of what was to come. Fujikawa. Fuji. Shin Fuji. Fujinomiya. 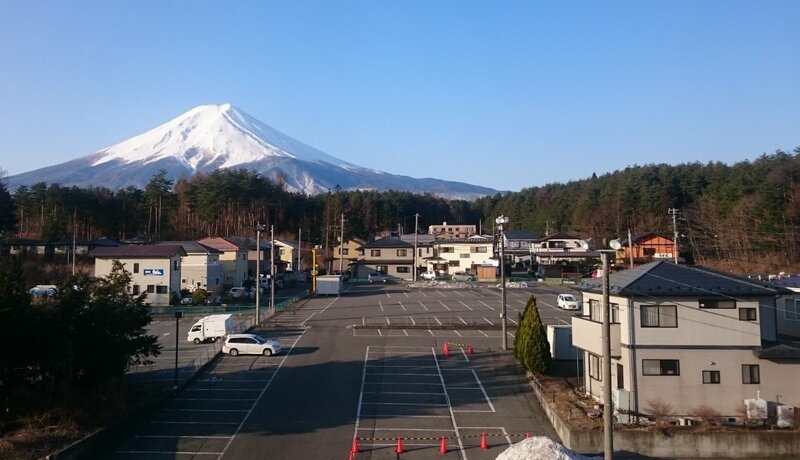 Often shrouded by cloud, and completely hidden, but lucky for us and for the next two days, we had Mt Fuji as our riding backdrop, framed with crisp blue sky. 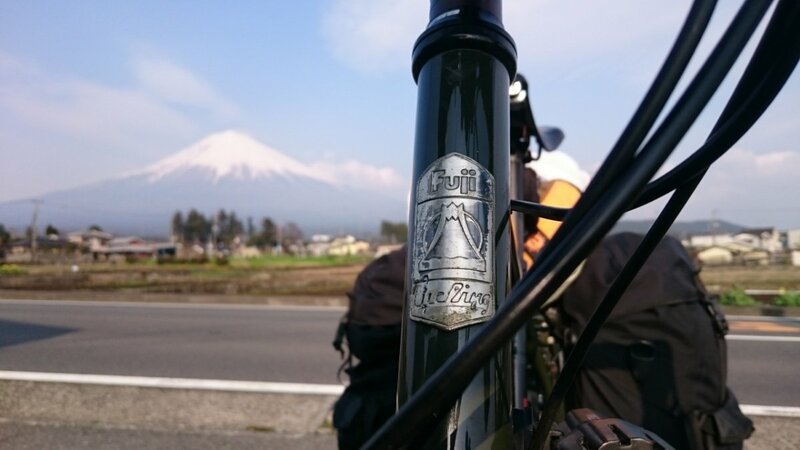 We had waited almost a year to be able to capture the real life version of the cute snow-capped logo on our Fuji Touring bicycles. We were looping around the top of Mt Fuji avoiding some of the larger roads leading into Tokyo. 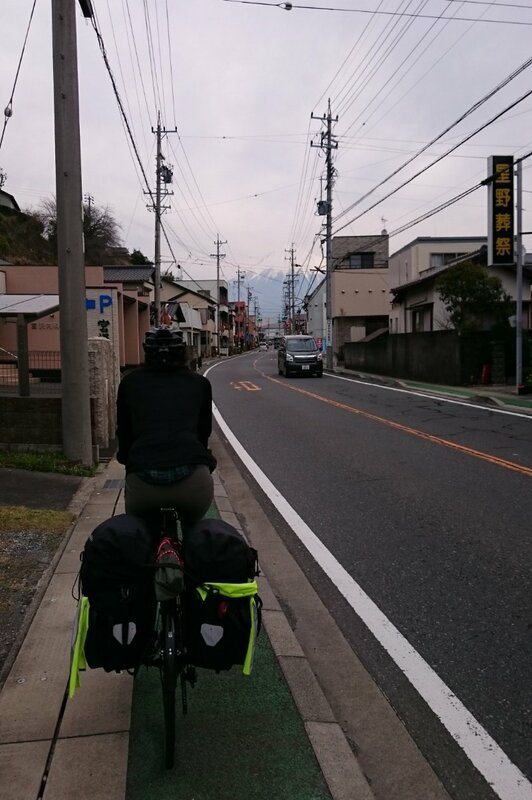 Although riddled with hills and tight roads in smaller towns we were rewarded with stunning scenery and Mt Fuji in our sights whenever the clouds cleared. 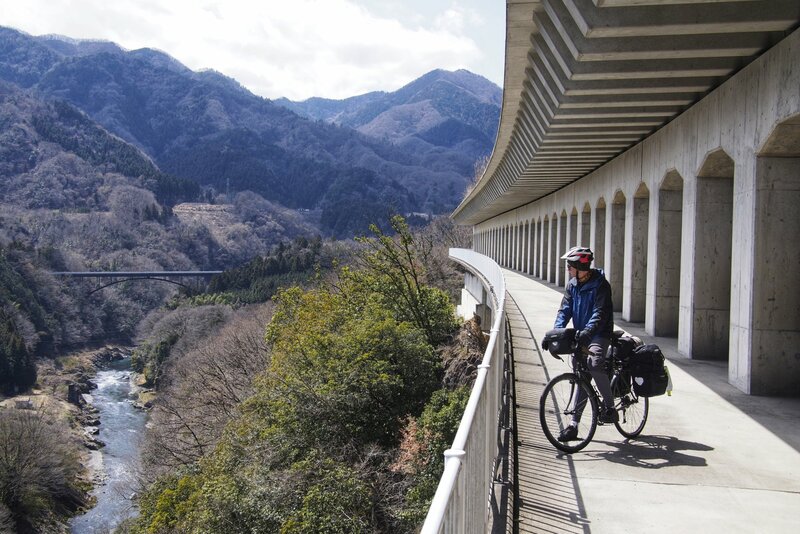 We wanted to make the most of these days as it would be not long before we would reach the never-ending concrete jungle that is Tokyo, and this was likely to be our last large run of riding alongside nature. One evening was spent in a 7/11 waiting for night to fall before we could cross the road and camp out in a souvenir shop car park with a view of the mountain. We had originally intended to stay at the proper campsite next door but it was closed, surrounded by a chain link fence. 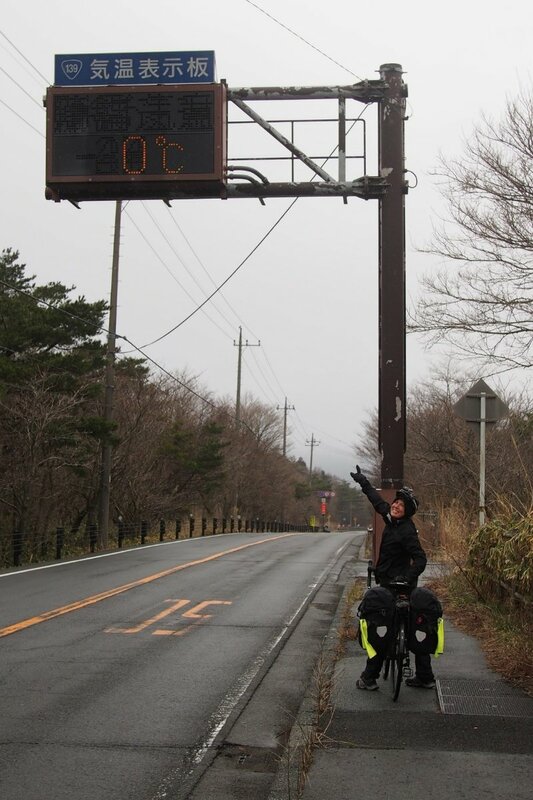 Sometimes the roads had helpful temperature gauges displaying the temperature we would wake up and bump out to. Not long after we came across a little bit of snow again. 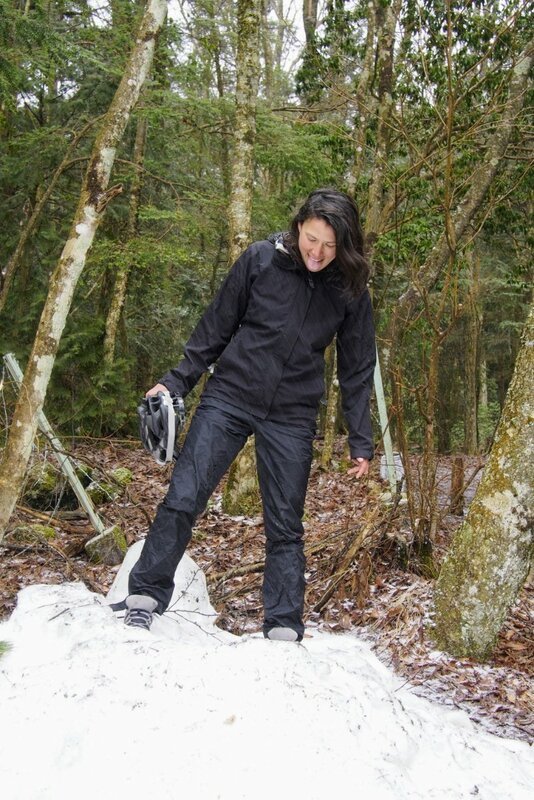 Being from Australia the novelty of snow never wore off on us. 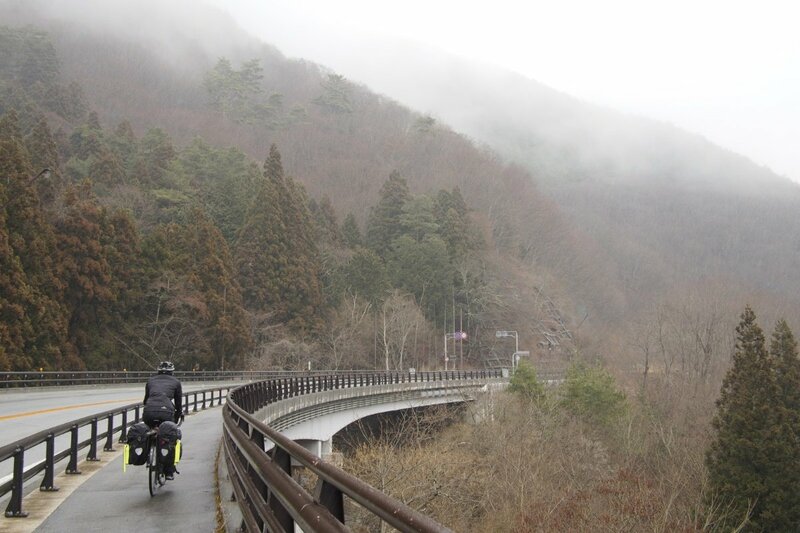 Having some cheap thick gloves purchased in a Lawson on the way made the riding far more enjoyable, as having cold feet or hands can drain the enjoyment out of a ride. 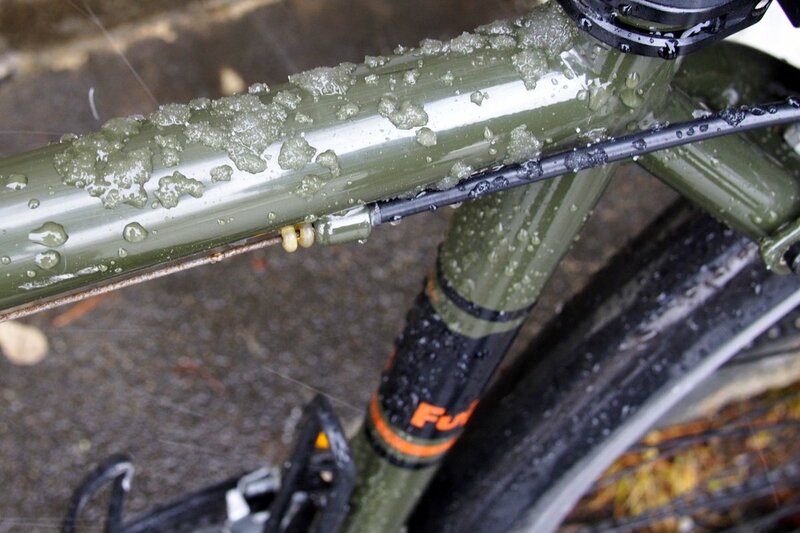 You know it’s cold when you get slush on the bicycle frame. It rained on and off all day. 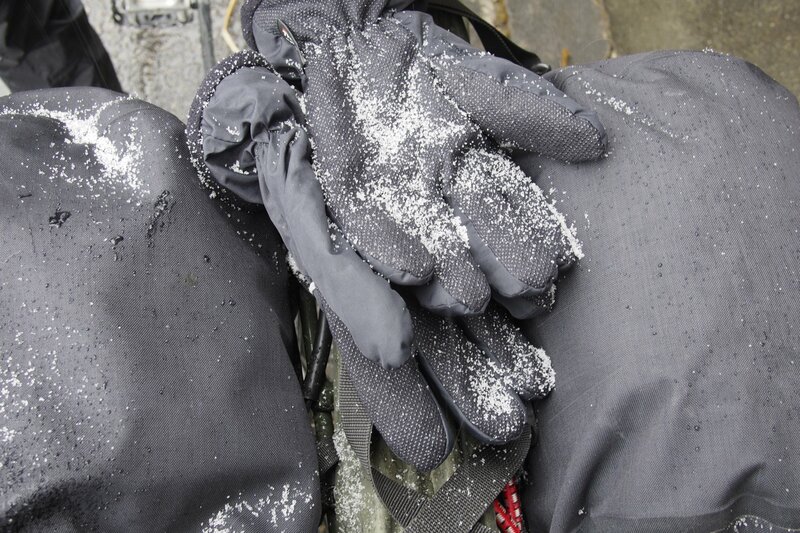 Unfortunately our gloves weren’t waterproof, but it was better than nothing. Plus we were just happy to be there, circumnavigating such an iconic spot, Mt Fuji. On our Fuji’s. 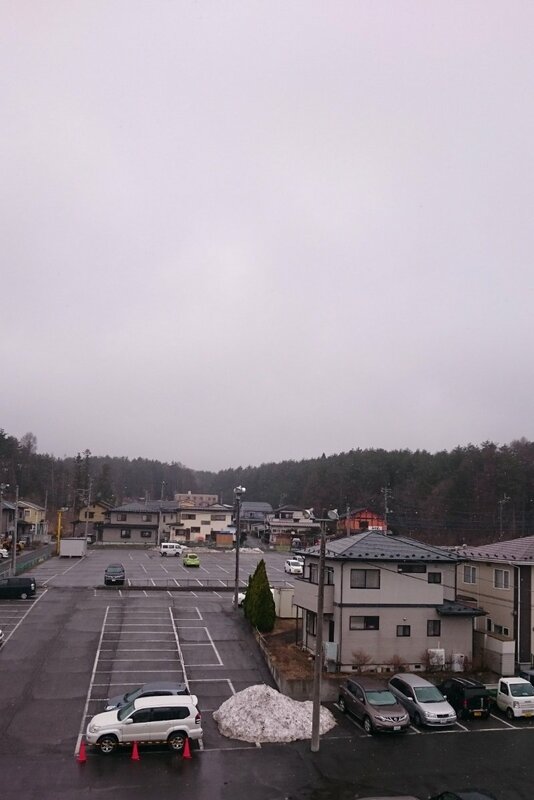 Snow started to fall, and wet and freezing now, we cycled into Fujiyoshida passing Fuji-Q Highland theme park, once famed for having the world’s tallest rollercoaster. Munching on convenience store noodles and taking advantage of the free WiFi we decided to keep out of the snow and book a hotel. We did not have far to go as the West-Inn Hotel was next door to the convenience store we were standing in. We were early for check-in so we sat in the empty hotel lounge to watch the snow fall outside. One of the staff members took pity on us and kindly found a room that was already cleaned so we could check in. Three hours early! She also let us use the laundry room, that had a dryer too, so our clothes and towels got a proper full wash. We had been washing our clothes in the shower, or not at all, so this was an unexpected treat. Our room had a spectacular view hidden until dawn. The 3,776 meter high volcano appeared in our room window, just in time for breakfast. From the convenience store. 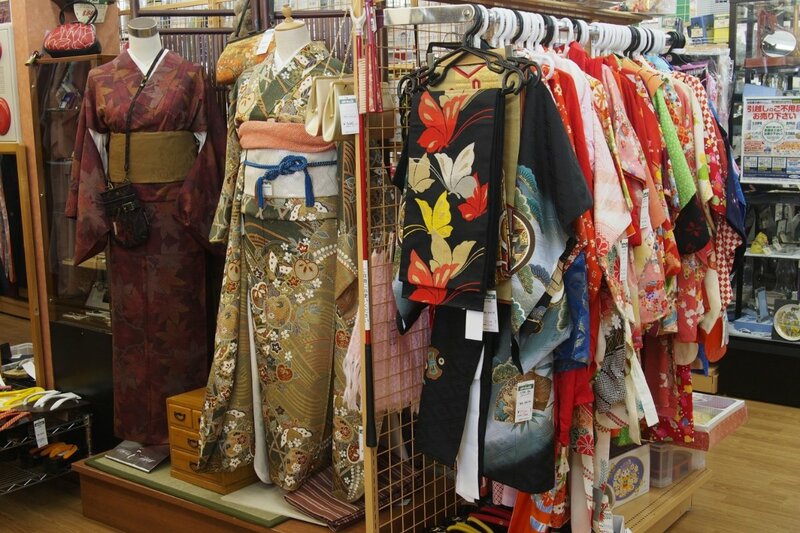 Now that we were getting closer to Tokyo we could stop in at our new favourite shops, with the unfortunate name of “Hard Off”, a chain of second-hand stores which are most abundant within a few hundred kilometres around Tokyo. 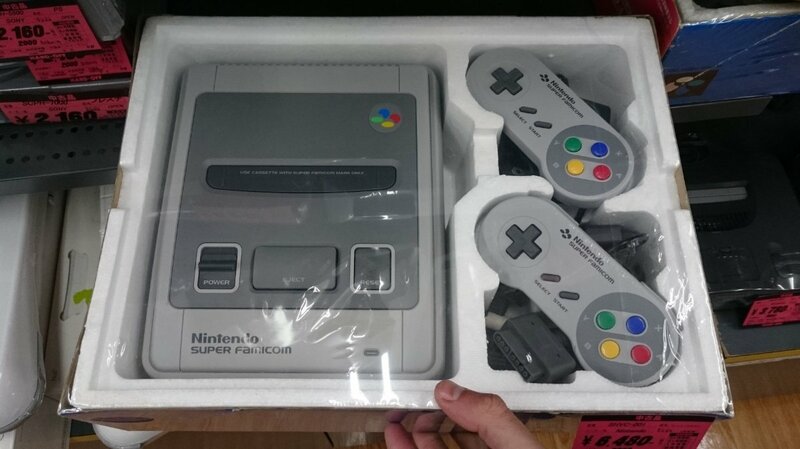 They are filled with second-hand goods, from kimonos and obis, to ski gear, to retro gaming systems still in their original packaging. 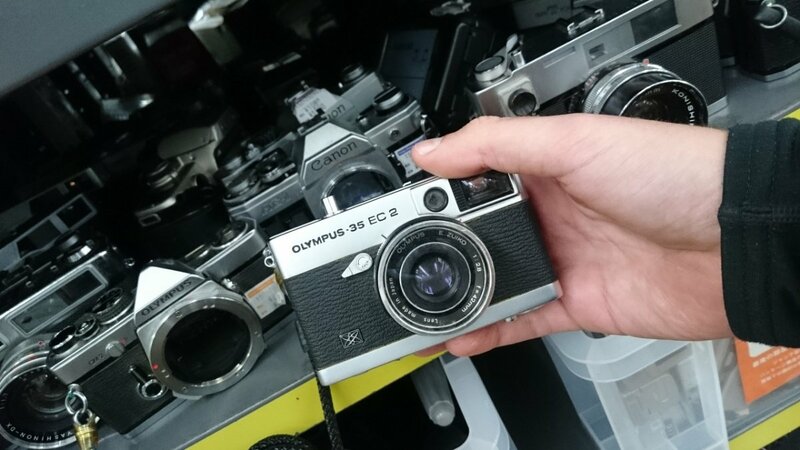 Despite the lack of room for purchases, we could not get enough of checking out all of the nostalgic items lining the shelves. 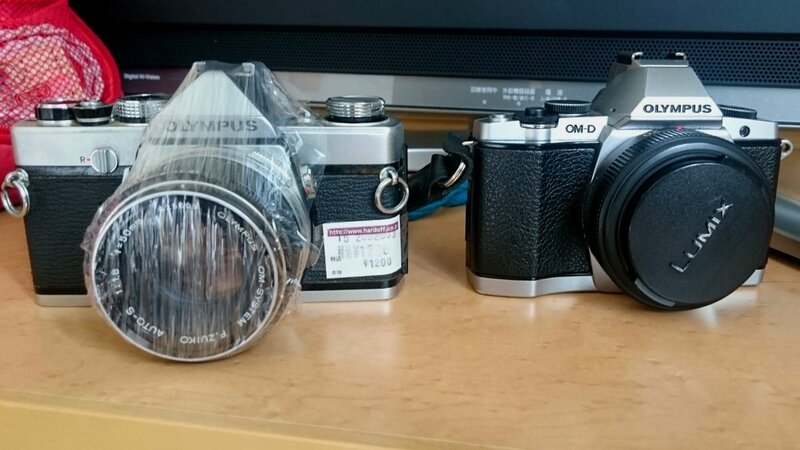 I was able to pick up the original version of my retro styled Canon OMD-M5, all for less than $15 AUD. After some more stunning scenery we started a slow climb into what appeared to be a jungle setting, complete with monkey road signs. Before I explain what happened next it would be prudent to mention that we had a few run ins with animals of the similar variety on our trip. In Malaysia, Suyin was mobbed by a large group of large dusky leaf monkeys scaring the hell out of her, and in Thailand I had a monkey jump on me, snatching up a bag of peanuts before exchanging a few heated words. So safe to say we did not have the best run interacting with monkeys. Moments after snapping the above shot of a cute monkey sign, Suyin rounded the top of the hill, excitingly yelling back to me to say she could see baby monkeys playing in the middle of the road, that looked exactly like the sign. Little did she know that the monkeys had also spotted her, and the baby monkeys were simply a diversion, a trap if you may. As I was peddling to catch up, Suyin looked to her left, where in arm’s reach, hanging from the bamboo at eye level, was the alpha male of the group, twice as large as the other monkeys. They both simultaneously let out a primitive yell. Suyin frantically started to pedal but having just finished climbing a hill she was in the lowest gear possible and not making any headway. Alfa Monkey leaped from the tree right at her head, narrowly missing her panniers, and landing on the road, swiftly picking up the pursuit on foot. Luckily it was downhill so Suyin naturally picked up speed, eventually the alpha male slowed up and ceased the chase. Safe to say our opinions on monkeys have not changed. Leaving the monkeys behind we were now out of the wild and heading towards the urban sprawl of Tokyo. Only looking back at our Strava map did it truly show how much of an interesting part of the world we had just cycled through. I’m enjoying following your trip. Hope you don’t mind but I shared it on a new Facebook page I’ve built recently. Tailwinds to both of you. Hi Paul, Hope you are well. Thanks for sharing the post and following along! Hey, so nice to read your new Report from Japan. Hope you have a good time there. Will you stay Long again? Since 3 month we have a young dog again, she is 6 month old and really lovely. Hey, that would be lovely to see you once again. Our new dog, Ronja ist growing very well and she`s loverly, always playing and a litlle naugthy too. Hope you are doing well and you stay home now? Back to work and in a new home?? Or still travelling wroound somewhere in the .worl? Enjoy life!! Love and greetings from Cologne.